November 2014 - What a Turkey! Here in the United States, the month of November heralds a time of Thanksgiving. It also means we get to stuff ourselves with turkey. And, to call something a "turkey" can also mean something that didn't turn out very good. So, this call for entries is just a little different. Show us your turkeys. I'm looking for an image that just didn't turn out the way you intended. Or how about something you created that you really don't like but everyone else loves. 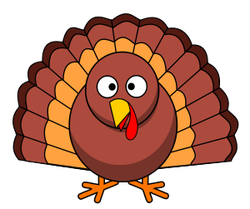 (Okay, and if you really want to, you can submit your favorite turkey image.) You get the idea! Show us your favorite "turkey" in any 2-D or 3-D medium.